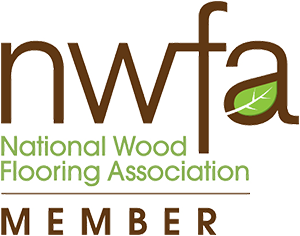 Every year, the NWFA and its members gather to find what’s new in the hardwood flooring industry, to share their experiences, exchange ideas, and to grow together by making new business relationships. This April, it was the sunny Dallas, home to the Gaylord Texan Resort & Convention Center’s turn to host the NWFA Exhibition. I became a member of the National Wood Flooring Association (NWFA) in 2010, and this year I had the opportunity to participate in their exhibition for the first time. In total, there were four days filled with activities, one more interesting than another. For example, there were education classes that focused specifically on one area of the hardwood flooring business. Others focused on the technical part of the hardwood flooring industry, and the NWFA Inspectors’ Seminars, repair shop, and also a nailing contest.Last but not least, there were a number of companies competing against each other to present their latest products and equipment. Pictured above, I am speaking with one of the representatives from Bona. Their new product features a commercial-grade high traffic ‘HD’ finish that takes 2-3 hours to dry, has very low VOCs and no sealer is needed over a newly-stained floor. He had mentioned that Bona Traffic is the leader in water-based finishes, but the HD version outperforms it because it is environmentally friendly, has low to no odor, and also has 40% less VOCs. Bona Traffic HD also has a higher durability than the regular Bona Traffic, dries in less time, and is scuff resistant. Another product that is very good for homes with children or elders, is the Bona Traffic Anti-Slip Satin. It is as strong as the regular Bona Traffic, but it has such a high slip resistance that it is often used on stairs, kitchens, nurseries, and other locations. Eighty percent of the products used by our company come from Bona, and we are focused on introducing the Bona Traffic HD, Bona Traffic Anti-Slip Satin, and other new products that they may offer, to our customers. Since the start of my business, I have vowed to invest only in products and tools that are the most long-lasting of them all. Among these providers, Loegler has given me the opportunity to purchase my sanding machines from them, and I could not be more than happy with their top-notch equipment! Such an event as the NWFA Exhibition offers their participants activities that combine something that is useful, with something that is fun. One of these instances was the Nailing Contest, where I had the opportunity to be a technical assistant, and I was able to see people’s craftsmanship be put to the test and then be compensated for their efforts with very attractive prizes. I was also very impressed to see that a woman participated in the contest! But, back to business. Among the shows and festivities that took place at the NWFA Exhibition, there were also the education classes that covered areas like Marketing & Sales, Technical Skills, just to list a few. The NWNFCAP Inspector Symposium was by far, I think for me and the other members of the NWFA, the most interest class education package. The speakers focused on the most pressing problems that challenge the hardwood flooring industry, and stressed the effect this has on its wood flooring professionals in their daily work. But let me not forget about some of the key speakers: Howard Putnam, former CEO of Southwest Airlines. He came and spoke to us about how this company was able to become so immense, and the community of customers they built in order to make their business prosper. All in all, the NWFA was a great experience and it gave me the opportunity to form business relationships, get acquainted with new products that just hit the market, and volunteer my time to helping others increase their hardwood flooring knowledge. Back home, we are ready to put to use the new information we learned, and offer our customers, people like you, a more high-quality service than before!